Climbers ascending past the crater below the summit of Mt. Baker with Sherman Peak in the background. Sean Wang. If you would like to experience the thrill of climbing immense glaciers to the summit of one of North America's most impressive alpine giants, this short trip is one to put on your agenda. Climbing Mt. Baker with a guide is the perfect introduction to mountaineering and a rewarding experience in its own right. You can combine this course with a two-day Introduction to Backpacking if you lack prior backpacking experience. If you are a beginning climber, we will introduce you to the essentials of glacier climbing before establishing a high camp well up the mountain. We'll cover ice axe and cramponing techniques and effective roping procedures for glacier travel, and we'll introduce you to the skills of route finding and hazard evaluation. For those climbers who have previous glacier experience, we will use that day and a half to review and advance your skills in glacier climbing technique and self-rescue. We offer a three-day climb on the north side of the mountain which ascends the classic Coleman-Deming route. Our high camp on the Coleman Glacier is among the most beautiful alpine sites in the U.S. From them we enjoy great views of our route, the many alpine peaks surrounding us, and the San Juan Islands to our west in Washington's inland Pacific waters. On summit day we'll start climbing well before dawn to get the best snow conditions on the way to Mt. Baker's 10,781-foot summit. The glacier climbing is as varied as the views, and you'll have the chance to apply all the skills you mastered in the first part of the trip. Groups in this program are kept small (usually three to five climbers with one guide or six to ten climbers with two guides), and throughout the trip you will enjoy a very rich learning and climbing experience. If you are training for independent climbs in the future, we recommend the 6-day Alpinism 1 - Introduction to Mountaineering but if you want to get a feel for mountaineering in less time, this shorter program will give you a rich and memorable introduction to the beauty, excitement, and reward of major alpine ascents. 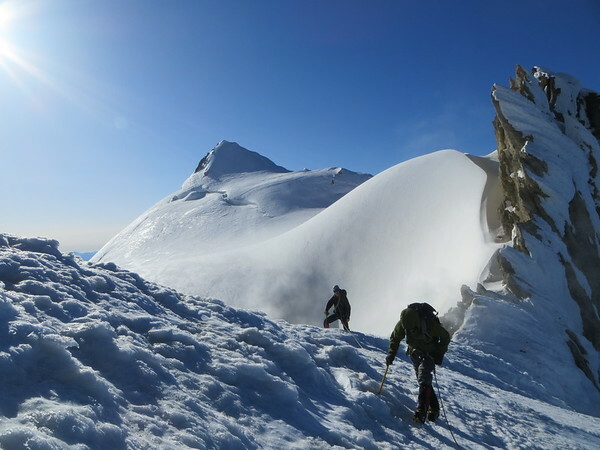 During AAI's three-day skills and climbing program on Mount Baker, we typically attempt the standard route on the north side of the mountain, the Coleman-Deming route. This route is also referred to as the Heliotrope Ridge route, as the approach to the glacier follows that geographical feature. The trailhead on the north side of Mount Baker is at 3700 feet, and the hike to camp is about 4.5 miles on a nicely maintained hiker's trail. After a gear check at AAI's headquarters, we drive to the trailhead and hike to a camp below the Coleman Glacier's icefall at approximately 5500 feet. We spend the afternoon of Day 1 and all of Day 2 practicing skills on the glacier and preparing for the summit climb the next morning. Depending on the preference of the guide and climbers, we may choose to establish a high camp on the glacier at 7500 feet, below the "Black Buttes." Climbing above our high camp, at 9000 feet we gain a col (saddle) between Mount Baker and one of its subsidiary summits, Colfax Peak. Just beyond the col, we move onto the Deming Glacier, which flows down the southwest flank of Mt. Baker. We ascend Pumice Ridge for a few hundred feet to the base of the Roman Wall, which is the last obstacle on the way to Mount Baker's 10,781-foot summit. The Roman Wall is nearly 1000 feet of 35-45 degree snow and ice that rolls over onto the summit ice cap of Mount Baker. The true summit is a few minutes stroll on level ground from the top of the Roman Wall. From the summit the sights are breathtaking, and we will enjoy sweeping views that stretch from the Canadian border peaks in the north, across the islands in the San Juan archipelago to the west, and out to the hundreds of peaks in the Cascades to the south and east. The North Ridge of Mount Baker is among the most classic ice lines of the Cascades volcanoes. The approach itself can include challenging route finding and ice climbing as climbers navigate the wildly crevassed Roosevelt Glacier to access the base of the North Ridge. Once on the route, we climb 50-degree slopes to the base of the technical crux, three to four pitches of ice climbing that are typically between 65 degrees and vertical. Above the ice pitches we follow the crest of the ridge. From the summit we descend the standard Coleman-Deming route back to camp. The climbing on the North Ridge is never overly difficult but is constantly and delightfully exposed and provides a big mountain feel. The Coleman Headwall is the largest ice face in the Cascades Range. Rising over 2200 feet from the base of the wall to the top, this route offers climbers an almost unbroken line of steep snow and ice climbing right to Mount Baker's summit ice cap. The climbing on the headwall is mostly in the 55-degree range, but there can be a number of short, steep sections requiring steep ice climbing technique. Because of this route's committing nature, climbers need to have experience with high angle snow and ice climbing, be very physically fit, and be capable of ice climbing with a pack on. The Roman Mustache is more of a variation to the standard route rather than a different climbing objective altogether. Below the saddle at 9000 feet, the Mustache route heads to climbers' left and negotiates an icefall before blending into the upper part of the Roman Wall described in the standard route description. This route is a great choice for climbers who are well versed at moderate glacier travel and who would like to spend a little time on steeper, more complex terrain during their ascent of Mount Baker. May 11 - May 13, 2019 - Waitlist Available! May 25 - May 27, 2019 - Waitlist Available! Jun 08 - Jun 10, 2019 - Waitlist Available! Jun 22 - Jun 24, 2019 - Waitlist Available! Jul 06 - Jul 08, 2019 - Waitlist Available! Jul 20 - Jul 22, 2019 - Waitlist Available! Aug 03 - Aug 05, 2019 - Waitlist Available! Aug 17 - Aug 19, 2019 - Waitlist Available! Aug 31 - Sep 02, 2019 - Waitlist Available! In addition to the dates we publish for this climb, we can also easily set up additional dates for groups and/or individuals as they are requested. We have almost unlimited availability throughout the summer but at certain times our schedule does book up. To make sure a particular date range is available please call (800-424-2249) or email our office. If you lack overnight backpacking experience, you can add a 2-day backpacking and wilderness skills course at a discounted price. Tuition for the program includes the guide's fee, transportation to the mountains (except on private trips), and all group climbing equipment (ropes and hardware). Personal equipment is not included in the program cost, but it can be rented from our equipment shop. A complete list of recommended and required equipment will be sent to you upon registration. We also offer a porter program for individuals who require physical assistance. Contact us for more information. "My guide and I connected perfectly right off the bat. It felt as if we were climbing partners and had known each other for a long time." "The course curriculum contained excellent content including crevasse rescue, route finding, weather interpretation, and equipment." "In spite of this being a "summit climb", my guide turned it into a classroom. I learned far more than I expected in 3 days." "[Our guides] had a laid back, calm attitude that allowed those of us struggling to keep our dignity and feel good about what we had accomplished. We also appreciated their interest in the people they were guiding. It made a nice atmosphere for the whole team to get to know and enjoy each other." Guided climbs of the highest mountain in the lower 48 states of the U.S, including the Mountaineers Route, the East Face, and the East Buttress.